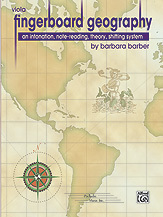 String pedagogue Barbara Barber has developed an intonation system which teaches string players the layout of the fingerboard and takes the guesswork out of playing in tune. In Viola Fingerboard Geography, Volume 1, "Finger Marches" establish the 1st finger "home base" note on all four strings. Finger Pattern Exercises -- 12 color-coded patterns -- develop quick, precise action in the left hand without the need for fingerboard tapes. Fingerboard Geography Exercises teach note names, distances, and intervals for all the notes in 1st position. No Fear Shifting has students sailing effortlessly all the way to 8th position on their first day of shifting. Viola Fingerboard Geography, Volume 1, concludes with dozens of Practice Suggestions for pieces in the Suzuki® Viola School, Volumes 1-4, but can be used as a daily warm-up routine and complements perfectly any beginning viola method. The book includes 4 pull-out color-coded Finger Pattern charts.